A group of hitherto unknown 19th century documents has come to light revealing illegal trafficking of Chinese people to Latin America where they were forced into slavery. 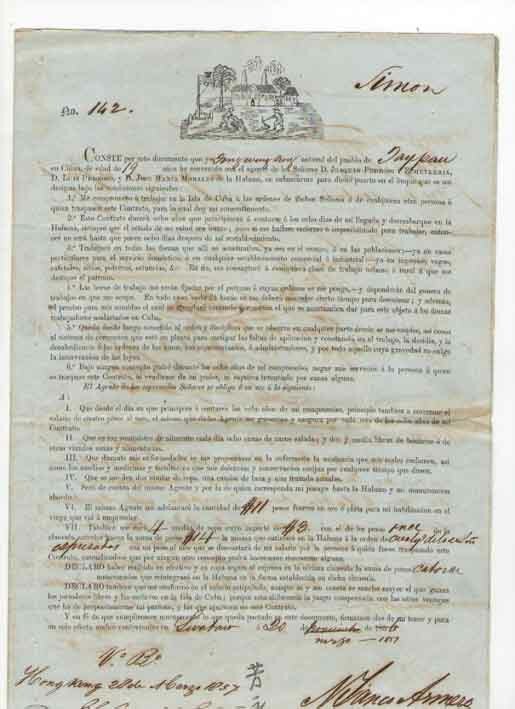 The documents - 'contracts' between plantation owners, railway companies and other organisations in Cuba - go under the hammer atMullock's Auctioneers'next sale of historical documents in Ludlow, Shropshire, on February 14. Each is estimated at £300. "The nature of these documents is quite appalling, and reveal the inhuman treatment of Chinese people by unscrupulous traffickers during the late 19th century - long after Britain had taken the lead to ban slavery throughout the British Empire," said auctioneer Richard Westwood-Brookes. "People were tricked into thinking that they were being taken to work in Cuba for decent wages and for a better life. In reality, they were forced into slavery, working on plantations and in heavy engineering projects, paid no money and made to work for a minimum of eight years." Known as the 'Middle Passage of Chinese to Cuba', the period led to what became a thriving Chinese community in Cuba which exists to this day.